"This is a rare and valuable book that combines readable explanations, computer code, and active learning." "...an impressive book that I do not hesitate recommending for prospective data analysts and applied statisticians!" "The content of this book has been developed over a decade+ of McElreath's teaching and mentoring of graduate students, post docs, and other colleagues, and it really shows." 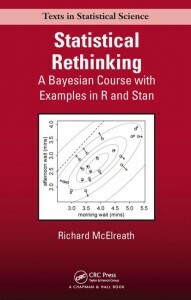 "...omg suddenly everything makes sense..."
Statistical Rethinking is an introduction to applied Bayesian data analysis, aimed at PhD students and researchers in the natural and social sciences. This audience has had some calculus and linear algebra, and one or two joyless undergraduate courses in statistics. I've been teaching applied statistics to this audience for about a decade now, and this book has evolved from that experience. The book teaches generalized linear multilevel modeling (GLMMs) from a Bayesian perspective, relying on a simple logical interpretation of Bayesian probability and maximum entropy. The book covers the basics of regression through multilevel models, as well as touching on measurement error, missing data, and Gaussian process models for spatial and network autocorrelation. This is not a traditional mathematical statistics book. Instead the approach is computational, using complete R code examples, aimed at developing skilled and skeptical scientists. Theory is explained through simulation exercises, using R code. And modeling examples are fully worked, with R code displayed within the main text. Mathematical depth is given in optional "overthinking" boxes throughout. The book is accompanied by an R package, rethinking. The package is available here and from on github. The core of this package is two functions, map and map2stan, that allow many different statistical models to be built up from standard model formulas. This has the virtue of forcing the user to lay out all of the assumptions. The function map performs maximum a posteriori fitting. The function map2stan builds a Stan model that can be used to fit the model using MCMC sampling. Some of the more advanced models in the last chapter are written directly in Stan code, in order to provide a bridge to a more general tool. There is also a technical manual with additional documentation.